Charles Ahovissi is a professional artist dancer, drummer, choreographer, educator, stage costume designer and tailor. He is an approved teaching and performing artist through the Nebraska and Iowa Arts Councils. Charles Ahovissi has participated in the John F. Kennedy Center for the Performing Arts' Seminar," Planning Effective Arts-Integrated Residencies for Students", Laying a Foundation: Defining Arts Integration and Anatomy of a Lesson: Designing Instruction in Cedar Falls, at the University Northern of Iowa. 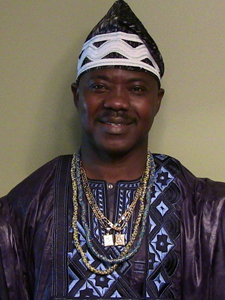 Since 1986, Charles has toured the world as a member of the Ballet National of Benin, performing and teaching traditional African dance and drumming. Now residing in Omaha, Charles wants to share his knowledge and love of Africa through traditional dancing and drumming to foster better understanding of Africa’s diverse and beautiful cultures. Through dancing and drumming during public performances, school assemblies, residencies, and workshops, Charles promotes unity and multiculturalism while offering students a fun, social and physical activity. Charles provides multicultural lessons by giving students authentic, hands-on experiences with African culture. He creates an authentic African village ambiance and uses ceremonial African clothes as well as traditional instruments to teach about African culture. Charles incorporates a variety of activities into his educational programs depending on the length. Creating African crafts such as masks, necklaces, shakers, headbands, stamp cloth and ankle bells can also be incorporated into residencies.